Easy Installation & Deployment Simply connect the TB3 dock to your laptop with the included TB3 cable and start working immediately. No time-consuming driver installations are required. Set up a second monitor using the included USB-C to DisplayPort cable adapter, eliminating the need for extra adapters. 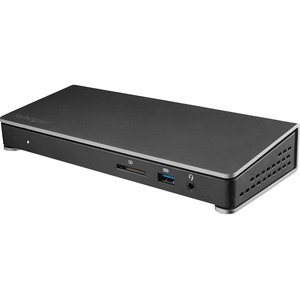 Plenty of Ports Including SD Card Reader The TB3 docking station offers six USB 3.0 ports, including a Fast-Charge port and USB-C port, an GbE port and audio/microphone port. The built-in SD card reader adds storage not usually available on most docking stations. 85W Power Delivery Using a single cable, the universal laptop docking station provides up to 85W of Power Delivery to power and charge your laptop, and power your peripherals with its 180W power adapter. TB3DOCK2DPPD is backed by a StarTech.com 3-year warranty and free lifetime technical support.